Hello, I have a problem closing a JSF HTML Dialog. 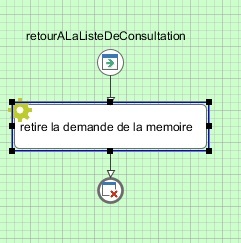 A start process is launching a JSF HTML Dialog (consultation List Demande) with a list of demands (some data). In this list of demand each demand can be displayed by cliking on a button. 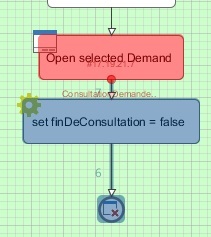 This button launches another JSF HTML Dialog (open selected demand) which displays the details of this demand. When finished, the user click on the exit button. A ExitEnd is used to get back to the first HTML Dialog. 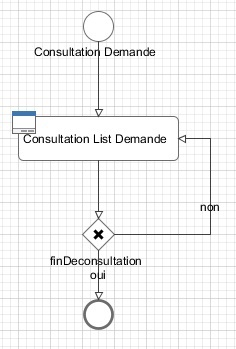 I want to display the list of demands again so i close the "selectDemande" to get back to the Start Process and if a boolean is false i restart the first HTML dialog (with the list). It's like the ExitEnd closes the second HTML Dialog (the one with the detail) again and not the one with the list. There is obviously something I do wrong but I can't see what. 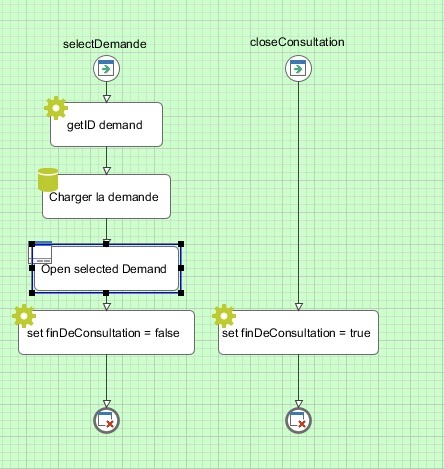 Instead of opening another User Dialog to display the selected demand you could work around the problem by using a primefaces modal dialog (p:dialog) which is not rendred by default. If the users selects a "demand" you could update the "rendered" flag of the p:dialog from false to true. And it's concrete content. Thank you for the answer. I've solved my problem by calling the second dialog in the start process. That seems to work. I still don't understand what was the problem calling a dialog in the logic of another dialog. If it doesn't work why is it possible to do it (the icon is in the palette) ? Thanks again for your answer. Is it possible to override a HTML-JSF-Dialog with another HTML-JSF-Dialog? 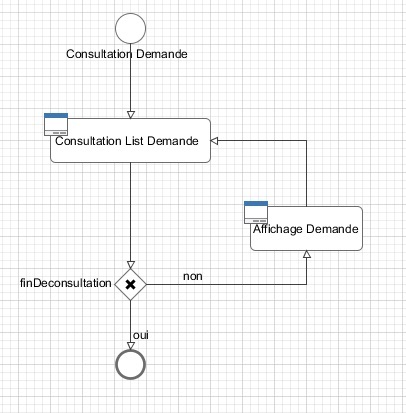 how can I programmtically import or export processes in ivy designer into xml files?